In a recent project a customer asked to change the default Web Access background. Not just to a static image by replacing the default image, but the customer wanted the background to reflect the current Bing wallpaper, since the Bing wallpaper changes every day. After explaining that this might be a legal issue, and the customer must contact the Bing team and his legal department to confirm that we are allowed to do this, I started doing some research. All legal things aside (and I take no responsibility whatsoever), here’s my solution. 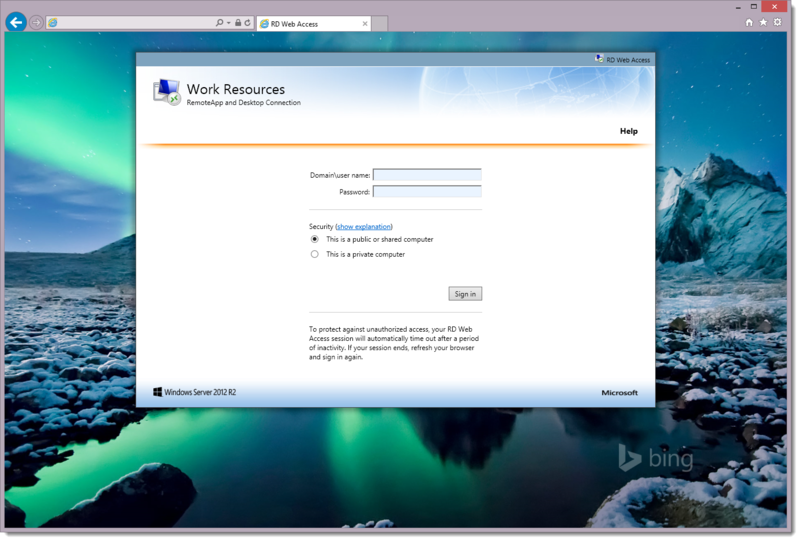 On a side note, I’m installing / configuring everything on the RD Web Access server itself. You can use any other server, but you need to configure some things differently if you choose not to install it on the RD Web Access server, but I leave that to you. Download the Visual C++ 2010 x86 Redistributable here and install it. This is a pre-requisite for the tool I’m about to install. Only select the main program and a country of your choice. I prefer to use USA. After installation browse to the installation folder and open “settings.conf”. Note that you can also set Proxy settings here if need be. Now, when running the tool’s executable it will output a file named “wallpaper.jpg”. Since the Bing wallpaper changes once a day, we need to run the tool at least once a day to meet the customer’s goal. 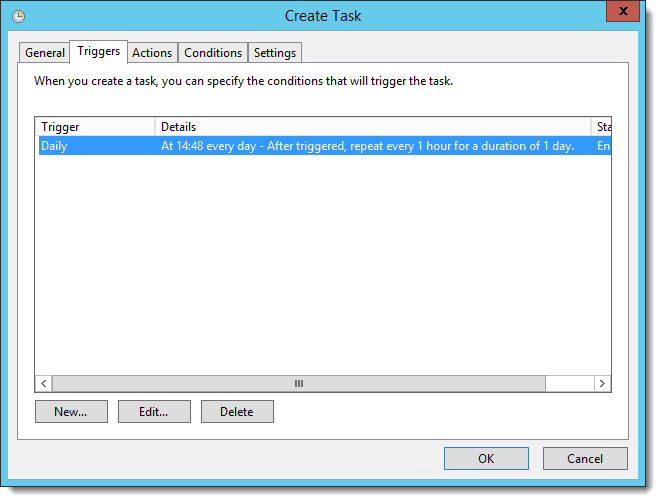 Create a Scheduled task using Task Scheduler (under Administrative Tools) for this. Run whether user is logged on or not (always run). Run with highest privileges (we need to be able to write the “wallpaper.jpg”). 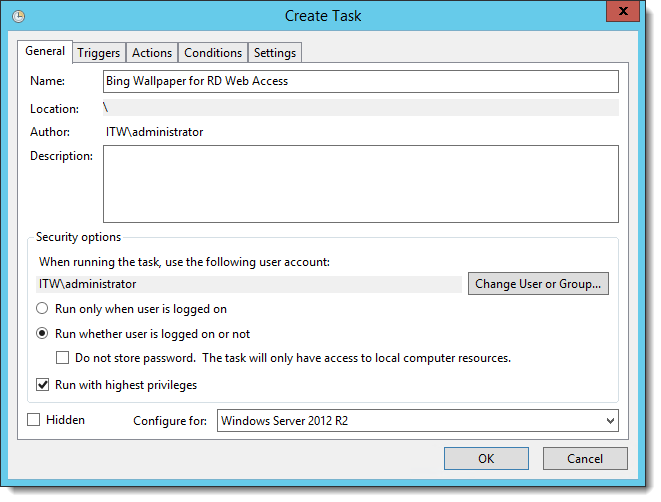 In this example I run the task in the Domain Administrator context. Remember this is not best practice. Instead create a user for this purpose and assign it just the right amount of rights to run this task. I choose to run it all day, each hour. Create a schedule that fits your needs. Of course we want a program to run. 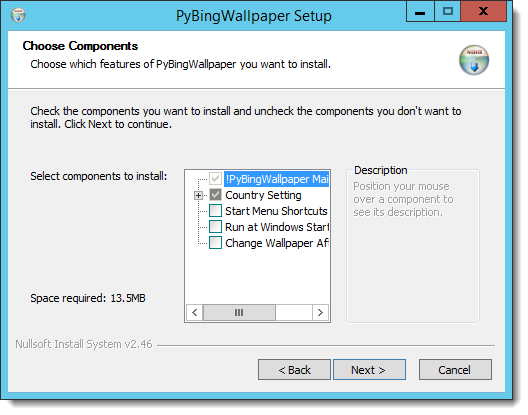 Browse to the PyBingWallpaper installation folder and select “BingWallpaper-cli.exe”. This is the commandline tool that gets the Bing wallpaper and stores it as “wallpaper.jpg” in the location you specified in “settings.conf” earlier. 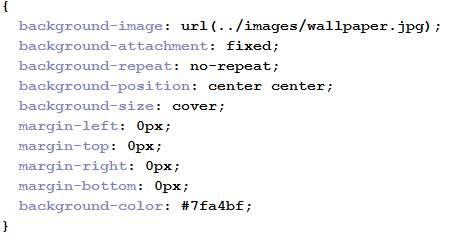 Now we need to tell RD Web Access to use “wallpaper.jpg”. Open tswa.css from C:\Windows\Web\RDWeb\Pages\en-US in an editor. 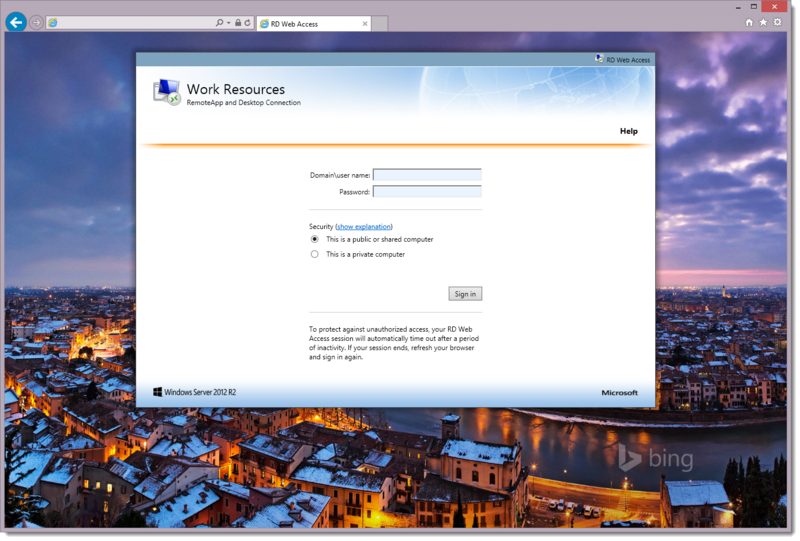 Voila, automated Bing Wallpaper in RD Web Access. Again, still not sure if it’s legal to use the Bing Wallpapers this way, but it works. 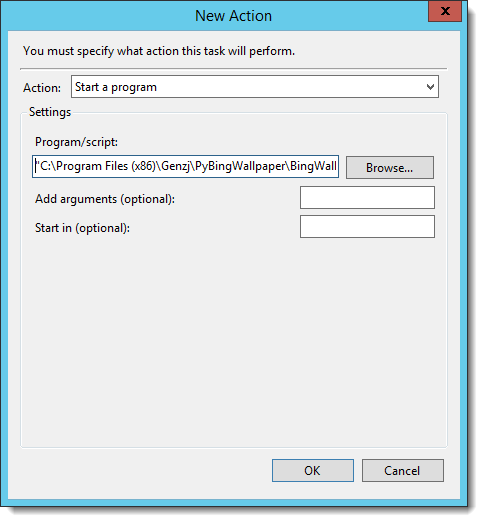 Colleague Michael Verbeek posted a solution for downloading the current Bing Wallpaper using Powershell. You can check his article and his solution here. Unlike SP2010 / RDS, there’s no guide to use the RDS WebPart. I have looked into this extensively. If you search for this on the interwebs you’ll probably find some threads to which I’ve contributed as well. The only thing I can think of at the moment is building your own SP App or Webpart based on the RDS XML feed. I’ve been reading all your RDWeb posts and WOW what a great inspiration and source of knowledge! I had no idea it was possible to customize RDWeb as much as you can. The changes for connect to remote PC as you showed in this post https://msfreaks.wordpress.com/2014/01/30/step-by-step-customizing-rd-web-access-2012-r2-part-3/ made me think. Would it somehow be possible to show icons for a user to connect to only for the computer(s) where a user is marked as Primary User? Basically, make a dynamic query that shows or preferably generates different RDP Files for each user when they connect to their primary PCs (they can have more than 1)? As a user might not know or remember the name of their PCs, it would be so cool to provide a connection to it automatically based on the AD attribute. But would of course be better to have a dynamic AD query. Whats your thought on that? I haven’t thought of that option up till now, and I must say, thinking about it, it would be very much possible to do a query based on the logged on user. I will put it on my to-do list, but don’t hold your breath, life is swamped at the moment..
How do you deal with the end user devices caching the background? I tried setting the response header to expire the web content, but that doesn’t stop browsers from using the cached background.